There is an open source meet up in our organization. 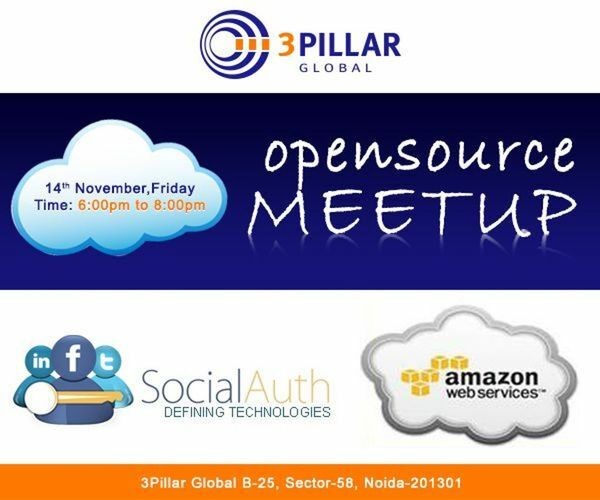 Please reach our office on November 14,friday to find out more about SocialAuth and Amazon Web services. Please touch base with me for this event on given below number. Façade means “The face or front”. Facade pattern works in a similar manner as its name means. A definition as given below reference from dofactory. IN a layman words “façade provides an interface to interact with sub layers to provide the desired result without interacting with sub layers directly from console”. I have used a very basic and daily used real life example to show the case. A Mobile shop. As in the image shown above, customer is asking for a phone of brand Samsung under the 15000 INR. He just asked to an interface/ façade layer “shopkeeper”. It doesn’t matter for him what happened behind the scene but he wants the mobile as he desired. Now we jumped into a code segment and understand it practically. Stock, Price, - These are subsystems. 3:   /// Facade Design Pattern. · The main advantages of this pattern are that you only interact with an interface to get desired result. What happens behind the scene doesn’t matter. · There will be an entry point to each level of layered software. · A tightly coupled system. Entry point is dependent on sub layers. · Façade layers have to create many objects of subclasses internally to get desired output. "Design Patterns are general, repeatable solutions to common recurring problems in software development." A "pattern" has been defined as "an idea that has been useful in one practical context and will probably be useful in others". A design pattern is not a finished design that can be transformed directly into code. It is a description or template for how to solve a problem that can be used in many different situations. Object-oriented design patterns typically show relationships and interactions between classes or objects, without specifying the final application classes or objects that are involved. 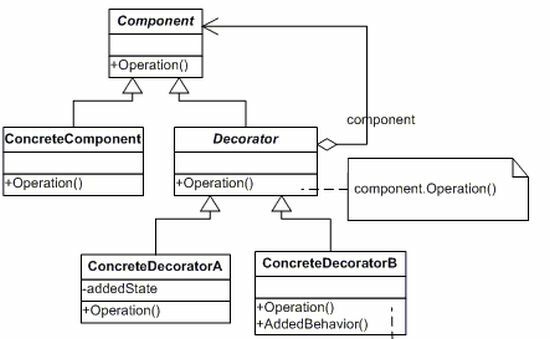 In this article I'll try to share my thoughts of one of Structural Design Pattern named Decorator. Structural Design Patterns are concerned with how classes and objects are combined to form larger structures. Let's jump into this and try to swim. The Gang Of Four (GOF) defines the Decorator pattern as "Attach additional responsibilities to an object dynamically. Decorators provide a flexible alternative to subclassing for extending functionality." In our applications we occasionally create an object with some basic requirements and later we'd like to add some more functionality to this object dynamically with additional subclasses, in that scenario we use the Decorator Pattern. Let's assume we have an object that saves a stream in a Comma Separated Value (CSV) format. Later we need to add more behavior to the same object to save that stream in a bit more secure format like a PDF with a password. This defines the interface for all the dynamic functionalities that can be added to the reference to a ConcreateComponent. To understand the decorator pattern let us extend the example being used here. We have a Pizza class as a base class. Later we may add more stuff, like toppings on each Pizza, for example extra cheeze, Onions and Jalapeno with Baby Corn. I have chosen a very simple example (Pizza) because most people would be familiar with this. Though there could be the same scenario for other objects like for Ice Cream and Coffee. Let us start by creating the component class. 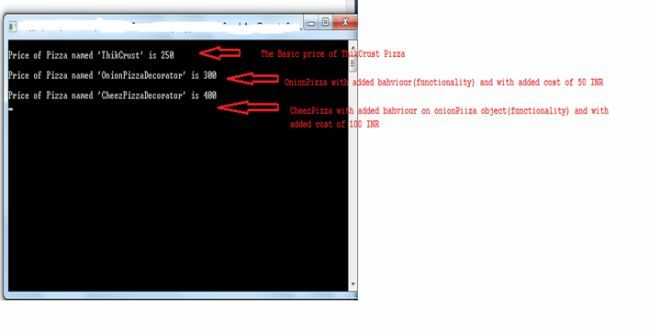 Here is the ConcreateConponent class defines the functionality of the base class Pizza. We are done with the ConcreateConponent and ready for our base object. Now we need to add additional functionality to the base Pizza like the toppings, cheeze and other extra stuff. Let's create a Decorator Class. The main advantages of the decorator is to continue the use of the original class. Because there may be many reasons to change the class. 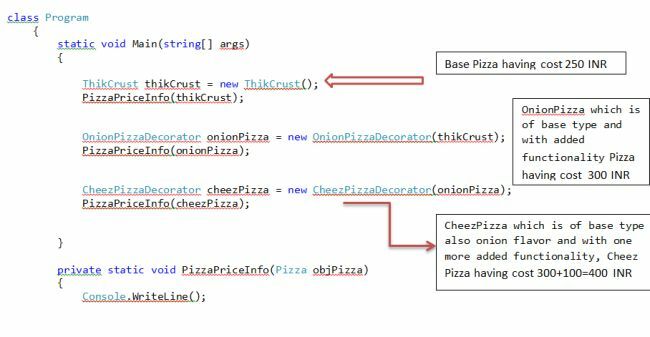 The Decorator class code structure is shown below that extends the base Pizza class. First, this class extends the Pizza abstract class. The reason for that is a ThikCrust with a Component will also be a Pizza and thus all the operations possible on a Pizza should also be possible on a decorated Pizza. The classes CheezPizzaDecorator and OnionPizzaDecorator extends the Decorator class also and has its own added behavior. You can find this class implementation in the sample application. Now our client application can create a combination of these ConcreteComponents with any Decorator. Let's look at the sample code implementation for the client. It's very easy to understand, especially for those who are not familiar with this pattern. Hope you enjoyed this illustration.